Apartment close to the beach and the shops. Building with a lift. Charming apartment renovated in a provencal style. Building with a lift next to the Coches d'Eau Station. 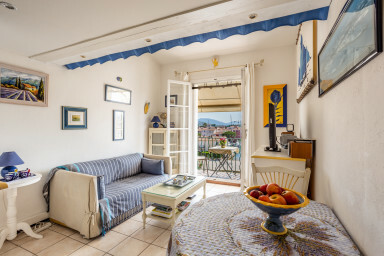 A living-room with an open-plan kitchen, 1 bedroom with a large bed, a bathroom and a big mezzanine with 2 single beds. West-oriented balcony with a lovely view on the canal and on the Grimaud Castle. The beach is less than 5-minute away by walk. The shops and restaurants are at the bottom of the building.